Despite all the gloomy fundamental news for the euro, the euro vs dollar has, in fact, surged higher today probably as a result of a better than expected Spanish bond auction coupled with some worse than the pending home sales data which came in at -30% as opposed to a forecast of -7.4%, and both of them negative against last month’s positive number. 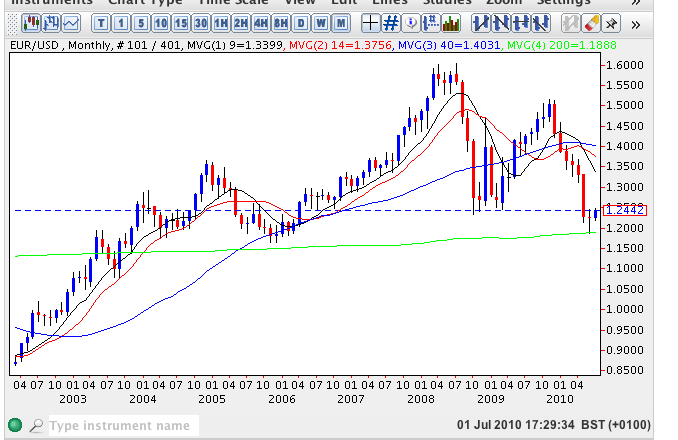 From a technical perspective today’s dramatic rally is not entirely unexpected given the pattern on the monthly chart where as we can see June ended as a deep long legged doji candle with the low of the month bouncing off support at the 200 month moving average signalling a possible reversal as a result. 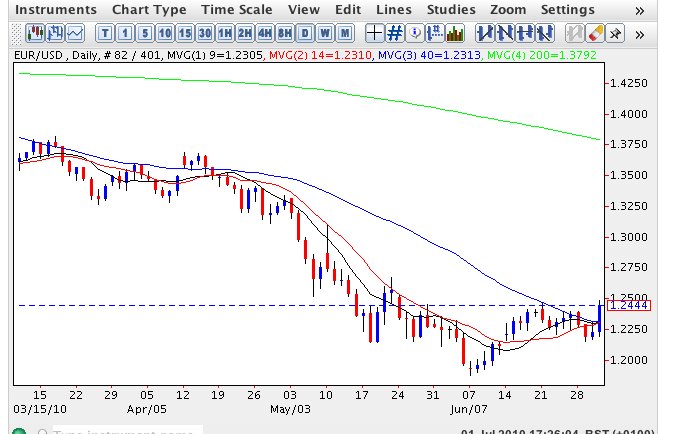 Moving to the daily chart this reversal has happened sooner than we expected pushing the euro vs dollar through all three of the shorter term moving averages and towards the psychological USD1.25 price level. The move has coincided with an equally dramatic fall in the usd index. Moving forward, tomorrow of course, sees the release of the non farm payroll data which if it follows yesterday’s ADP data which came in at 13k against a forecast of 59k, which suggest the nfp will be even worse than the expected -106k. With relationships in the forex markets undergoing radical changes and traditional correlations breaking down, tomorrow’s number could just see the euro move even higher whatever the data.